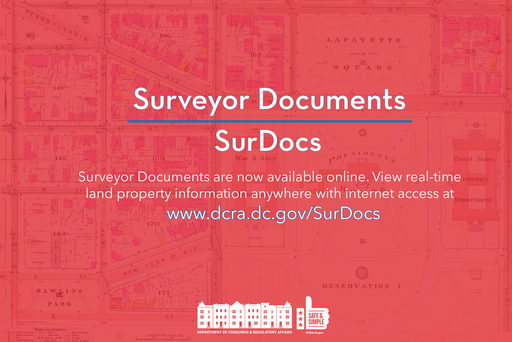 Today, the Department of Consumer and Regulatory Affairs (DCRA) began offering online access to surveyor documents, allowing residents and businesses to obtain information about lot lines from anywhere with internet access. Using the Surveyor Document System, commonly known as SurDocs, online access to surveyor documents will make available to District residents and businesses more than 10,000 copies of field surveys and surveyor plats. The existing records cover a period of more than two centuries. Today’s SurDocs release represents the third consecutive month that DCRA has launched a new system or program as a part of the agency’s Safe & Simple initiative. Plats are often used as a part of a building permit application to ensure that the proposed construction is contained within the appropriate lot and that it complies with the District’s zoning regulations. Previously, customers could obtain the documents only by visiting the agency in person. Beginning today, residents and businesses can obtain copies of the documents online and without a trip to the agency. To help first-time customers with the SurDocs system, DCRA has created a video with instructions on how-to-use the new online tool. Also, a SurDocs User Manualaccompanies the video to help navigate through this new online service. Learn more here. Through DCRA’s Safe & Simple initiative, the agency is focused on neighborhood safety and simplified processes. Visit DCRA’s Safe & Simple webpage for more information. If you have any questions regarding this announcement, please contact the DCRA Communications Team at DCRACommTeam@dc.gov.